Conference Hours 9 a.m.–2:30 p.m. This third annual free agricultural conference and trade show was designed to meet the economic and environmental needs of small farmers and beginning gardeners, as well as generate a positive impact by building connections between farmers, educators, and agriculture-related businesses. 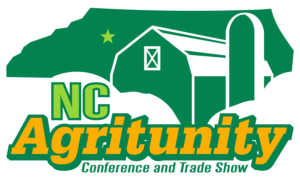 NC Agritunity is a collaborative effort between N.C. Cooperative Extension agents in Iredell, Alexander, Caldwell, Catawba, Rowan, and Wilkes counties. Heritage Homestead Goat Dairy is nestled on 17 acres in the mountains of Ashe County just outside of Jefferson, North Carolina. Carol and Lon Coulter purchased the farm in 1994, which had been a working cow dairy until the early 70s. To help clear the briars and brambles that had taken over the farm, the Coulters purchased goats. One thing led to another and soon enough Carol was milking goats and taking cheese classes. In January of 2009, Heritage Homestead became a licensed dairy. The Coulters raise Saanens, Alpines and a few Nubians. Their wonderful sweet milk is made into farmstead cheese sold at local farmers’ markets and select retail shops. The goats are milked for 8 months out of the year and bred and kid in mid-March-April and the cycle begins again. For more information about Carol Coulter and Heritage Homestead Goat Dairy, check out their website. Participants will also be able to visit trade show vendors including agricultural businesses, suppliers and manufacturers, non-profits, and service agencies. Registration is open now for this FREE event through Eventbrite. From 1-40: Take exit 148. East on US 64 and 90 to second traffic signal light. Right on Bristol Drive. Go approximately .3 miles to building on right. From 1-77: Take exit 49-A. West on Garner Bagnal Blvd (from Charlotte turn left). Go approximately 4.3 miles to traffic signal light. Left on Bristol Drive. Go approximately .3 miles to building on right. From Downtown Statesville: Take Front Street west to intersection with Garner Bagnal Blvd. Continue across Garner Bagnal Blvd onto Bristol Drive for approximately .3 miles to building on right. Please see the attached .pdf form for vendor information/application. This will include price options, vendors schedule, and contact information.